By 2016 the stadium will undergo a complete revamp, although the 1928 and 1939 parts are to be retained for their historical value. All sections around the track’s curves are to be transformed into green areas, while stands along the track will be all-seated (at 11,000 capacity) and covered. The stadium is to hold large events during the 2017 World Games organized by Wrocław. Most centrally located stadium in Gdansk was built on the site of former fortifications along the Opływ Motławy waterfront. Opening in 1925 means it was commissioned by Germans as part of the Free City of Danzig. Thus the initial name was Kampfbahn Niederstadt. Used for football and athletics, among other, it was equipped with wooden benches set atop sloped land with only one wooden grandstand. This changed in 1950s, when – under Polish government – new land embankments were created, presumably from Gdansk post-war rubble. With concrete terracing the stadium was then larger and more impressive, but most of its grandeur was created by the northern Marathon Gate and its monumental colonnade. Though now deformed by various updates, the gate still exists today. The following decade saw the stadium’s transition to speedway-specific and this discipline remains its main use to date. No wonder the stadium was given patronage of Zbigniew Podlecki, Europe and World champion, who died in 2009. With step-by-step updates the stadium is changing in attempt to keep its standard up-to-date. The story behind Katowice’s less known club has been connected to the city’s south-west areas since 1925, when the club formed by miners from Wujek Coal Mine formed it. Current stadium was opened in 1974 after a series of moves by Rozwój. It has single-tiered land embankments around the field. Should they be fully used, the stadium would have a very significant capacity, but low demand and limited funding allowed to open only 8 sections, offering 2,400 seats. There are three training pitch next to the stadium. The municipal stadium Olecko was built in 1930 as part of a larger recreational complex along the bank of Olecko Wielkie lake. 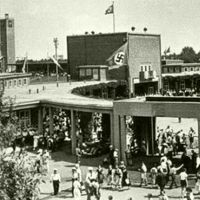 Official sources claim the stadium and its secondary infrastructure were used as a training centre by German Olympians ahead of the 1936 Berlin Olympics (Olecko was then under German authority). With one sloped grass-terrace in the west, the stadium was open towards the lake and surrounding park. The rare three-step terrace remains to date and wasn’t changed until 2010, when seats were installed over parts of it. Central section, covered in stone, went through more change with a vast wooden roof topping it.